If you spent the long weekend drinking enough rum to kill a pirate army, you’re not alone. Fifth of July, colloquially known as National Hangover Day, is a time for reflecting and repenting. Luckily for all our dumb asses, there’s a bright spot: Tonight, SpaceX will attempt to relaunch the rocket it was supposed to launch yesterday. It’s a Fifth of July miracle! This weekend, SpaceX aborted both of its attempts to launch a satellite payload on behalf of communications satellite services provider Intelsat. Earlier today, however, the Luxembourg-based company tweeted that SpaceX has given it the green light for tonight—the 58-minute launch window will open at 7:37pm EDT. 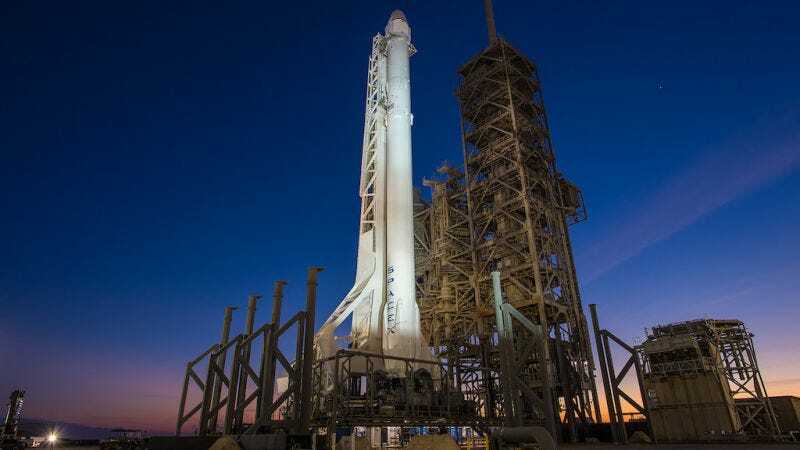 The Orlando Sentinel reports that there will be no attempt to recover the Falcon 9 rocket that will blast off tonight from Pad 39A in Cape Canaveral, Florida. The satellite will be placed in a high geostationary transfer orbit, and there’s not enough fuel to bring the rocket back to Earth for recovery. Still, it’ll be fun to watch a hunk of metal take off into Earth’s atmosphere, especially after the mission was scrubbed two days in a row. According to Elon Musk, SpaceX spent the Fourth of July “doing a full review of rocket & pad systems” to prep for tonight’s launch. Sunday’s launch was cancelled due to a computer guidance system error. Monday’s launch is still a bit of a mystery—Gizmodo has reached out to SpaceX for a statement regarding it and will update this post if and when we hear back.